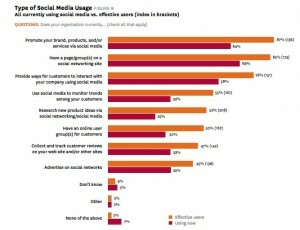 Within the survey, a small group of companies (12%) who identified themselves as “effective users” of social media shared some common practices. (Figure 8) They have moved beyond seeing social media as a “shiny object” or fad, and have started to see it as another part of their overall marketing strategy. While experimenting with their own social media offerings, they were more likely to be measuring their efforts as well as the social conversations about them. Like anything with business, you have to make the investment before you can realize a payoff. The only way to stop stabbing in the dark is the turn on the lights and bring in a guide. You wouldn't have someone that fixes the plumbing build the whole house, you would want them to focus on the plumbing because it's what they know. Until businesses come to this realization, they will continue to have difficulty trying to define success. The Business report review contains a good deal more information and like I said, is worth a read.